Cryogenic electron microscopy (cryoEM), with recent improvements in hardware and software, has become a very powerful technique for the high resolution structure determination of proteins (1). There are many advantages of CryoEM over crystallography; however one of the most important is that typically CryoEM structures can be determined from a few micrograms of purified material, rather than the milligram quantities usually needed for crystallography. 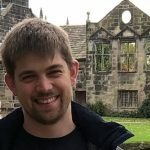 In this preprint the authors take this one step further and, using an ingenious combination of techniques, are able to solve the structure of an untagged protein from as little as one microliter of cell lysate. Figure 1 very clearly shows a basic protocol for this work, which I will briefly describe. Commercial antibodies specific to the α4 subunit of the 20S proteasome were treated with a kit to produce Fab fragments: these are minimal regions of antibodies containing only a single antigen binding site, rather than the two found on a complete antibody. Fab fragments were used rather than intact antibodies to prevent any potential cross-linking and aggregation. These Fabs were then biotinylated via a photocleavable linker and bound to paramagnetic streptavidin beads: the beads were then incubated with the lysate from 1 microliter of commercial HeLa cells. The proteasome complexes in the lysate bound to the Fabs, which were in turn bound to the streptavidin beads, immobilised in the magnetic trap and washed to remove all other protein and non-protein contaminants. Elution of the highly pure complexes was achieved by irradiation at a specific UV wavelength to detach the Fab fragments from their biotin tags. This high concentration sample was then applied to EM grids using the Cryowriter technique and frozen without blotting (2). The structure obtained from the data (figure 3) has an estimated resolution of 3.5 Å, which is similar to the previous cryoEM structure (3), suggesting that the technique does not affect the resolution significantly. The authors report that the structure largely agrees with previous crystallographic data. Interestingly, subunits β4-6 are less well resolved in the EM map, which the authors attribute to their flexibility. Additionally, the Fab fragments can be seen weakly in the density, which may have been useful for assigning the orientation of these pseudo-symmetric particles in the reconstruction. Figure 3. 3D reconstruction of the human 20S proteasome – Final EM map of the 20S proteasome coloured by subunit, showing the C2 symmetry axis and Fab fragments in grey only. As an another control, the authors add Tobacco Mosaic Virus at a known concentration in the wash buffer, which resulted in a 1.9 Å structure from the same micrographs as used for the proteasome. This again suggests that the set up does not prevent the generation of high resolution structural data. This article may have a large impact on the structural biology field. It shows that it is possible to solve structures of protein complexes expressed at native levels from very small volumes of cells. This work could pave the way for the examination and quantification of native protein complexes. Since this is a native sample, it might be expected that, in addition to the 20S proteasome, there would be other super-complexes such as the 26S proteasome. Did the authors see any evidence of this subpopulation? How long was the data collection? Was there any obvious preferential orientation of the proteasomes? How well does the proteasome express? Would this work for less well expressed proteins? Might this setup be useable with other expression tags, which could be used in combination with overexpression to promote the formation of certain complexes? The main reason I chose the article is because of how novel the technology is. As I have previously worked on crystallography, I think it’s amazing that structures can be solved from such small volumes of cells. I’m really looking forward to seeing this technology being used to probe the structure and stoichiometry of native protein complexes. Kühlbrandt W. The Resolution Revolution. Science. 2014;343(6178):1443. Arnold SA, Albiez S, Opara N, Chami M, Schmidli C, Bieri A, et al. Total Sample Conditioning and Preparation of Nanoliter Volumes for Electron Microscopy. ACS Nano. 2016 2016/05/24;10(5):4981-8.
da Fonseca PCA, Morris EP. 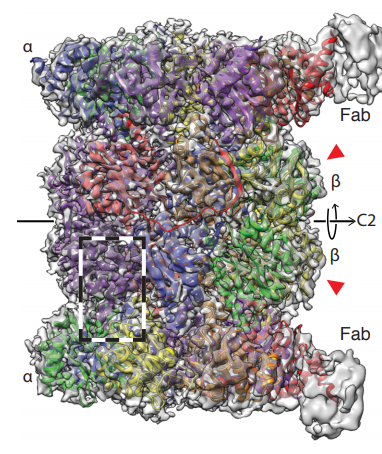 Cryo-EM reveals the conformation of a substrate analogue in the human 20S proteasome core. Nature Communications. 2015 07/02/online;6:7573.